Yesterday Rye turned 11. He was very hesitant at turning 11 because he said he wanted to stay 10 like Ben 10 forever. Rather than writing a letter to him this year, I decided I would interview him and allow him to give you a little insight into his life and what he thinks about his birthday. If there is one thing I could ask you all to take away from this video it is that many people who take time to educate themselves about Autism Spectrum Disorder know that difficulty with social skills is something that most people have a hard time with learning. Rye struggles, but Rye tries hard and he wants friends, he loves friends, and sometimes it takes the role of a good friend to make a friendship with Rye successful. Teach your children the two rules Rye and I have been talking a lot about lately. #1 - Friendship should be fun. It should be fun for both people which means both people have the same amount of power in the relationship. It is a give and take. Good friends don't always agree but they work through their problems to make it better. 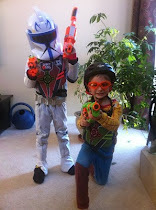 #2 - Thanks to a Clone Wars episode rule #2 has had a great impact. "Do not leave a man behind." If you see someone who is having a hard time making a friend or you see someone in the group who is alone, include them, talk to them and recognize that the rules of friendship do not come easy for all people. The greatest gift you can ever give your child is to teach them to seek out a friend who is having trouble, seek out a friend who doesn't have any friends. True friendship means both people in the relationship have the same amount of power. True friendship is not about pity, it's not about having all the control, it truly is about doing all you can do to not leave a man behind. Teach your children to take a chance on the kid who might be a little different, the kid who might not be able to make the first bid at interaction, and the kid who if you take a chance might just turn out to be somebody extraordinary and fun. I may be biased as he is my child but I can honestly say I don't have a better friend in my life than Rye. He always has my back, he loves me, and he is absolutely a lot of fun. If somebody offered me today the opportunity to change Rye so that he did not have ASD I would say with complete honesty "NO WAY". He is who he is...a friend, a son, and an absolutely amazing 11-year-old boy. I love you Rye. Happy Birthday sweet boy. Don't ever change who you are to make a friend, just keep trying and being the absolutely amazing, funny, gifted boy that you are. Momma loves you to the moon and back and as long as you are happy, I'm happy and so grateful everyday that I get to be your mom.